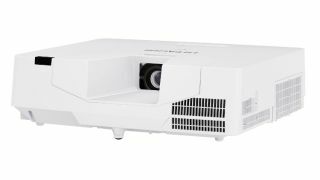 Today, Hitachi America, Ltd. announced the newest expansion to its Collegiate Series line with the addition of two new 3LCD laser projectors. Both the LP-EU5002 and the LP-EW5002 offer 5,000 ANSI lumens of brightness with resolutions ranging from WUXGA 1920x1200 to WXGA 1280x800 respectively. The maintenance-free operation projectors have 20,000 hours light source life and up to 50,000 hours with Long Life 2 mode. Both models have multiple digital inputs (HDMI and HDMI/MHL), 3LCD projection technology, and a contrast ratio of 500,000:1. They are equipped with 360° installation, a 1.6x zoom lens, and Perfect Fit 2, which helps integrators save time during installation. The new LP-EU5002 and LP-EW5002 Collegiate Series laser projectors are now available for purchase.